ANGLER with quality Offshore Development Center (ODC) services has good experience in building robust Filemaker applications. 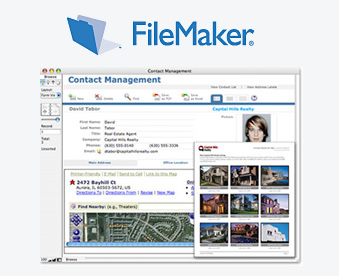 Filemaker Software is a cross-platform database application and a compatible version for both the Apple Mac OS and Microsoft Windows operating systems. It can also be networked to mixed Windows and MAX OS user base. ANGLER with quality Offshore Development Center (ODC) services has good experience in building robust Filemaker applications globally in India, UK, USA, Dubai, Singapore, Canada, Hong Kong, Germany, The Netherlands & South Africa. We have listed few of the major skill sets that we excel in. We had developed / implemented successfully filemaker applications to our clients with the standalone solutions. You do not need the filemaker software to run our applications. We have developed filemaker applications with online MySQL database as backend & filemaker application as front end. We have developed shopping cart websites in PHP Programming with Filemaker as backend. We have developed filemaker applications with XML importing from online with the help of XLST. ANGLER has developed some of the new products using Filemaker namely ANGLER SmartHR, which is an useful application for the HR Management to manage all their resumes in a same place, converting the candidates into employees, maintaining training record & having reports for each module separately. ANGLER has developed some of the new products using Filemaker Applications Development namely ANGLER NMS, which is an useful application for the front office team to maintain their clients, prospects & important companies details. Using this application, they can print address labels which can be used when they are sending the newsletter. Kiosk-based Filemaker Application: Creation of kiosk-based filemaker applications where all menus are hidden useful for mailing list sign up or event registrations. Access Restriction: ANGLER’s filemaker limit what users and groups see and do by restricting access to specific areas of FileMaker. You can more easily specify user’s privileges for viewing or editing layouts, value lists and scripts, menu items and more. Exporting Data: All our filemaker applications have options to export the filemaker data to excel, PDF, CSV and more. Data storage/ Retrieval: You can use filemaker applications to store large amounts of data and retrieve / access the data in a matter of few seconds. Contact Us today to know more about out filemaker Application services or to hire our filemaker developers to attend all your simple to complex Application development requirements.